I’ve decided to take a break from A Sand County Almanac while I work on my current project, Eliora. A promise made a decade ago brings two former lovers back together again. But Sigrim is engaged to be married to Hanne, and Eliora is being wooed by the very jealous Bela. A series of misunderstandings sets up a feud between Sigrim and Bela that comes to a head more than twenty years later. I have decided rather than set this book in the past of this world, which would involve a lot of research to make it historically correct, I will set it in a future Thirteen Kingdoms and it will take place a couple of centuries following the events of The Hallowed Treasures Saga. The trilogy is currently available on Kindle for 99¢ each. In Celebration . . .
To celebrate the recent publication of the Third Editions of out Best of the Appalachian Trail guides, the Hallowed Treasures Saga is on sale for 99¢ at the Kindle store. The Path to Misery is the first book in the trilogy. Centuries after an apocalypse, Princess Eluned leaves her father’s kingdom in search of adventure and romance. Instead, she finds herself accumulating a band of compatriots for a divinely-led quest to reunite the Thirteen Hallowed Treasures in an effort to restore peace to the Thirteen Kingdoms. In the process, she transforms from the self-absorbed girl she had been into the strong woman she must become. 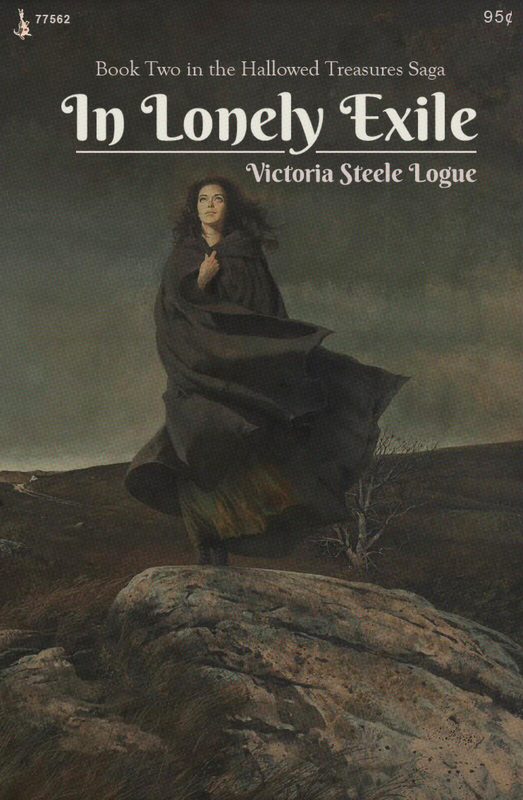 In Lonely Exile is the second book in the trilogy. It weaves in more of the history of their world and the individuals on the quest as they continue the search for the Hallowed Treasures. “A delightful reunion with old friends, sure to leave fans of strong female heroines craving the final installment,” Kirkus Review said. 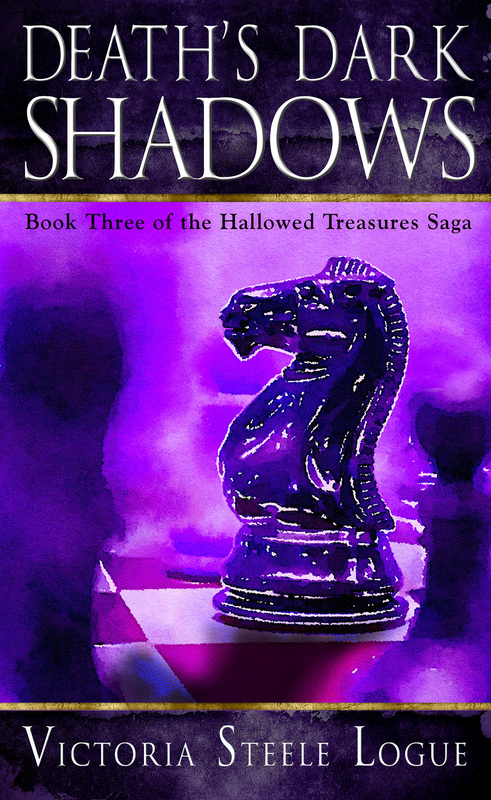 Death’s Dark Shadows is the final book in the trilogy. The Questers must now split up to continue the search for the last few treasures. In addition, they must disguise their identities in order to travel to the far reaches of the Thirteen Kingdoms as spies are seeking them out in towns and along the roads. Even on this divinely inspired quest, Omni may not prevent some of the group from having to give their lives to restore peace to the Thirteen Kingdoms. It is Advent, and the time when we sing one of my favorite hymns as Christmas approaches. But O Come, O Come, Emmanuel is not just one of my favorite Christmas hymns (O Holy Night and What Child Is This? are high on the list as well), but it is also the song from which I picked the titles of the three books in the Hallowed Treasures Saga. The song came first. The first two books had several working titles before I decided on The Path to Misery for the first book in the trilogy. But the song appeared early in the first book when the Princess Eluned, Jabberwock, and Bonpo finally make it through the snowstorm in the Mountains of Misericord, and Eluned sings: O come, Thou Key of David, come and open wide our heav’nly home; make safe the way that leads on high, and close the path to misery. Once I decided on The Path to Misery for the first book, it made it easy to incorporate lyrics from other verses into the next two books and to choose In Lonely Exile and Death’s Dark Shadows at their titles. The hymn is a translation of a Latin hymn, Veni, Veni, Emmanuel, which is a metrical paraphrase of the O Antiphons, a series of plainchant antiphons attached to the Magnificat at Vespers over the final days before Christmas. The 1861 translation, which I used to choose the titles, is from Hymns Ancient and Modern, and is the most used, by far, in the English-speaking world. Because the original song is in Latin, though, you will find many versions with different lyrics by artists who wished to copyright their version. While the hymn is often linked with the 12th century, the earliest surviving evidence of the hymn’s text is in the seventh edition of Psalteriolum Cantionum Catholicarum, which was published in Cologne in 1710. The familiar tune called Veni Emmanuel was first linked to this hymn in 1851, when it appeared in the Hymnal Noted, paired with an early revision of the English translation of the text. In 1966, British musicologist Mary Berry (also an Augustinian canoness and noted choral conductor) discovered a 15th-century French manuscript containing the melody. Most versions are sung to this tune today. And give them victory o’er the grave. And death’s dark shadows put to flight. And close the path to misery. In cloud and majesty and awe. I don’t claim to be an artist, but it sometimes helps me to sketch some of the characters (animals, anyway) that I am working on. 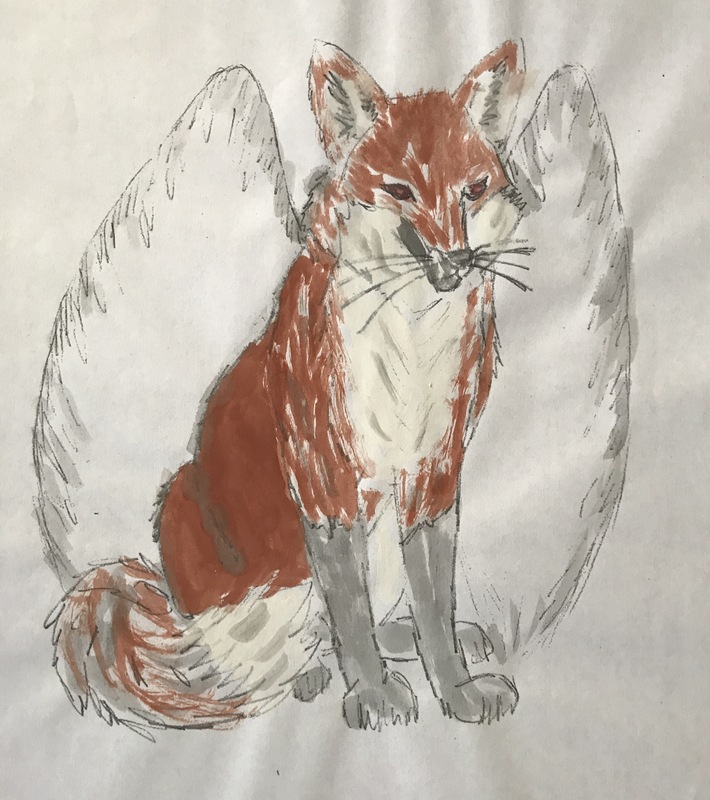 This is Rua the sionnach síth or faery fox from “In Lonely Exile”. The Princess had several names before I finally settled on Eluned (pronounced Eh-lee-ned). That happened when I realized the book had become a Quest for the Thirteen Hallowed Treasures, and I wanted the Princess to be named for one of them. That was easy. Naturally, she would take on the name of the Thirteenth Treasure: The Ring of Eluned or Eluned’s Ring and Stone: When it is placed on one’s finger, with the stone inside the hand and closed upon the stone, the wearer is invisible. I decided that I wanted “the stone” to be a moonstone; I also decided I didn’t want the stone affixed to the ring as it gave me a little more latitude with its use. He renames himself Jabberwock the Bandersnatch because the poem reminds him of the genocide of his breed. In actuality, his name is Hiurau the Janawar. Bonpo explains his name in “Death’s Dark Shadows”, the final book in the Hallowed Treasures Saga. He takes on this new name after he is exiled from the Kingdom of Dziron by his people, the Yeti, for causing the death of a human (all of which is learned in “The Path to Misery”. Bon is an older religion which exists alongside Tibetan Buddhism. Bonpos, as followers of Bon are known, go to Buddhist temples, but turn their prayer wheels in the opposite direction from Buddhists. I chose to call him Bonpo because my husband was reading “The Snow Leopard” by Peter Matthiesson while we were hiking the Appalachian Trail, and we used to joke that southbound through hikers were “bonpos”. That is, they hiked against the natural order, so to speak. Because Bonpo could no longer live as a Yeti, I saw him as going against the natural order of his fellow Yetis. What his real name is and why he chose Bonpo will remain a secret until after the publication of “Death’s Dark Shadows”. Gwrhyr (pronounced Goor-heer) also explains the meaning of his name in “Death’s Dark Shadows”. Basically, I chose it because means something along the lines of “translator” in Welsh, and for those who know Gwrhyr, you know that he speaks most of the languages of the Thirteen Kingdoms. 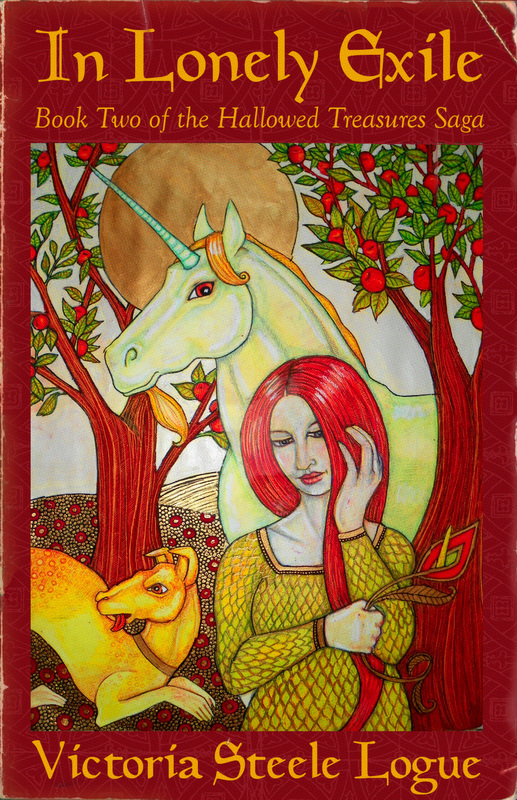 When I created the character of the gypsy, Chokhmah, I pictured her as the wiser, older woman, who helps Eluned begin the transition from girlhood to adulthood. Because I already had some Romanian Jewish gypsy music that I listen to and really like, I decided to make her character part of a more Hebrew-like Roma community—thus the name, Chokhmah, which means “wisdom” in Hebrew. I don’t actually remember why I chose Yona because when I came up with her character, I was also creating eleven other characters that were attending a dinner party at King Arawn’s castle in Prythew. I actually came up with the character of King Hevel of Adamah first (see below) and since his name was Hebrew, I decided to let his fiancée have a Hebrew name as well. In this case, I chose Yona, which means “dove” because “The Dove” was my trail name while through hiking the Appalachian Trail, and I already liked the character at this point although I didn’t realize then how important she would become. This character doesn’t appear until the second book, “In Lonely Exile.” Choosing his name was easy. It means “little wolf” in Irish. And, if you read the book you’ll understand the inside joke. Faolan is pronounced “fway-lahn”. Queen Njima of Naphtali is mentioned in the first book because Eluned would really like Yona to meet her, but she doesn’t appear until the second book. The inside joke here is that Njima means “dove” in Swahili. And that’s all I’m giving away. 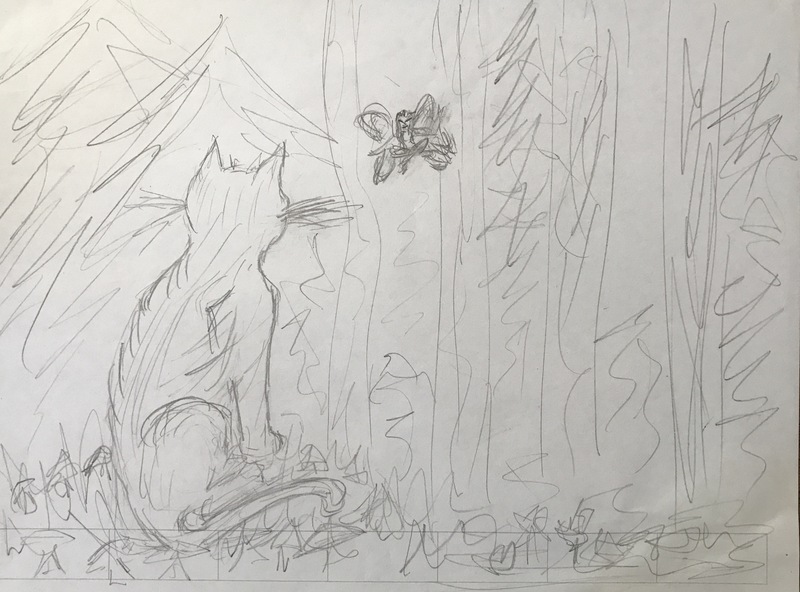 I sketched Kellas (faery cat) and Ziza (faery) before they appeared in the second book. Later, they needed to be in separate scenes. King Arawn (pronounced aroun like in ‘around’) received his name because Arawn is the god of the underworld, terror, and war in Welsh mythology and resides in Annwn (Annewven in this case). 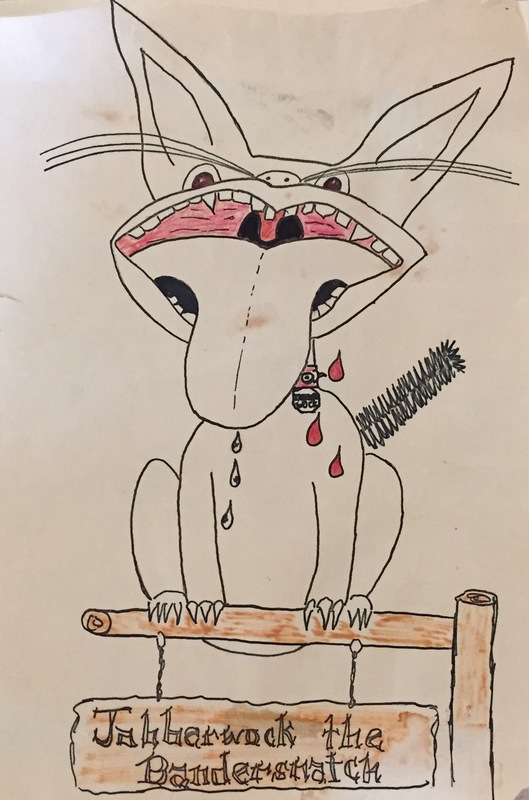 As I was listening to King Crimson’s “In the Court of the Crimson King” while writing a large part of the first book, I decided to make him the “Crimson King” as well. Pretty much everything in his kingdom has ties to Welsh mythology. Arawn’s right hand man, so to speak. Hamartia is from the Greek and means to “miss the mark” or “to err”. Hevel is also Hebrew and is difficult to define, but I was thinking of Ecclesiastes 1:2 when I chose it. It literally means “breath”, but in this case it means: meaningless, hollow, futile, useless, vain, which King Hevel clearly is. While she never actually appears in the book, Eluned’s great grandmother is important because of her books and because of her life. She hid her romance novels in the window seat in the room that becomes Eluned’s bedroom. It is both because of these novels that Eluned reads repeatedly, and the fact this woman ran away from her life as a queen to become an actress, that Eluned wants to experience adventure. I gave her the name Fuchsia in homage to the Lady Fuchsia in the Gormenghast Trilogy by Mervyn Peake. Originally, Eluned had this name and her looks are somewhat based on Peake’s Fuchsia. Is there a name you wonder about? 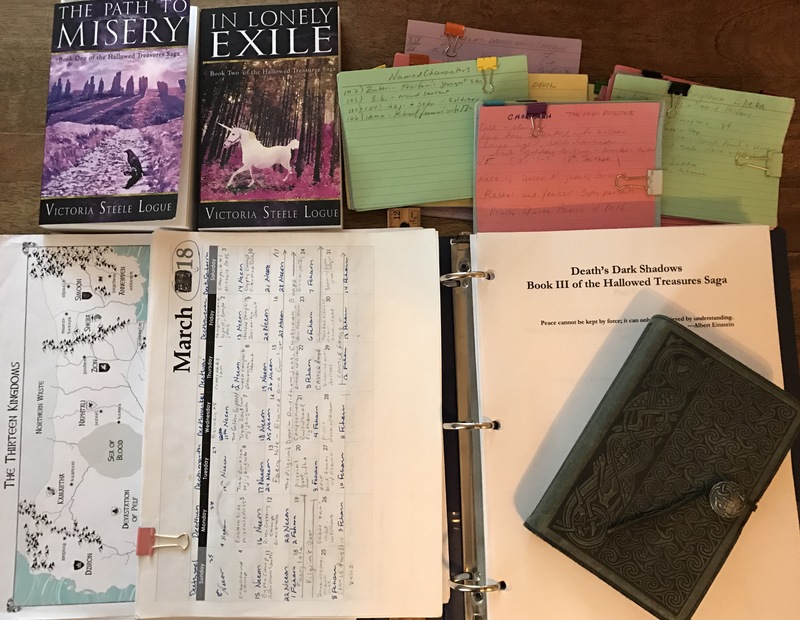 What it took for me to create a 3-book fantasy saga. It is finished. What began with the idea of one character in college (more than thirty years ago) and progressed to the concept of a Princess discovering the world beyond her father’s kingdom about ten years later, before morphing into the concept of a Divinely-inspired Quest to gather together the Thirteen Hallowed Treasures, has finally come to an end. 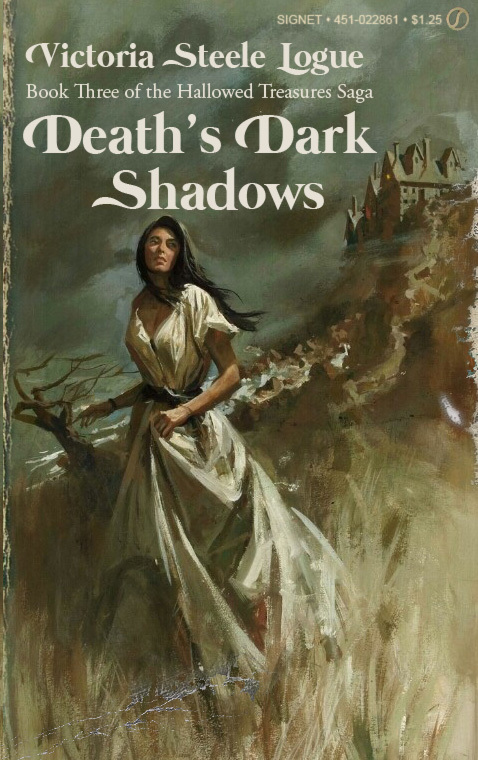 From The Path to Misery to In Lonely Exile to the final book in the saga, Death’s Dark Shadows, it needed more than 380,000 words to tell the tale. The photo above shows what it took (for me) to accomplish writing a fantasy set in a post, post apocalyptic world over the course of more than three years of travel set within Thirteen Kingdoms. Dozens of notecards detailing characters, food, lodgings, details about each of the Kingdoms and the Treasures, among other things, were absolutely essential. I also made calendars to keep track of where the characters were and how long it took them to reach their destinations. In Death’s Dark Shadows, I was able to maintain continuity by checking facts against the books that had already been published. I even went so far as to make notes and drawings in Eluned’s leather-bound journal. 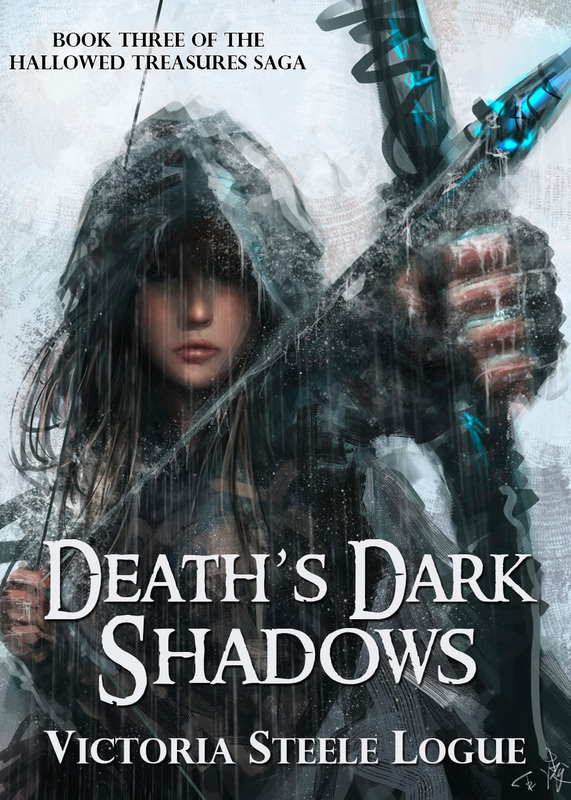 Hopefully, Death’s Dark Shadows will see publication in the late spring (it’s still in edits). And now I will turn my attention to the possibilities of what I will write next: Romantic Suspense? Historical Romance? Or a series of books for 7- to 12-year-olds? The drawing that inspired the character, Jabberwock, which I sketched while bored in Geology Lab.